What's it about? A documentary which follows a band of Congolese street musicians over a number of years as they record an album and get to escape the slums of Kinshasa for a while on a European tour. A feat all the more impressive since they use a variety of makeshift, homemade instruments and half the band are paraplegic. You couldn't make it up. Is it any good? Pretty inspiring stuff. 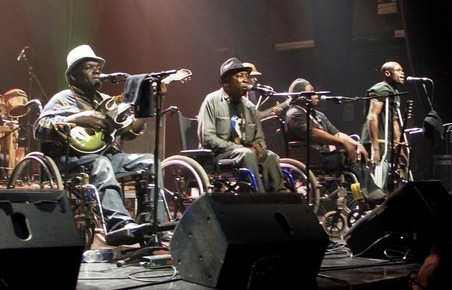 You cannot help but be impressed by the positive attitude of the band members, who do not let the fact that they are paraplegic stop them cruising the poverty-stricken streets of Kinshasa in their rickety tricycle-wheelchair contraptions like a gang of disabled Easy Riders. When you see the conditions and trials they must endure, it's all the more remarkable. As for the music, I personally wasn't that dying about their output, but their enthusiasm is infectious and I doubt even I could get better sound out of a tin-can monochord. Plus credit where credit is due for managing to fit the word 'poliomyelitis' into the lyrics of a song. Basically, if you look up 'triumph of the human spirit' in the dictionary, you wouldn't find it because it is a phrase, not a word. But if it was there, there would be a picture of Staff Benda Bilili underneath. Anything else I should know? The band have gone on to be a worldwide phenomenon and now make regular appearances at music festivals worldwide. You can read more about the band here and find out about their next appearances here. Here's a clip of them in action on Jools Holland - they've come along way since their impromptu sessions in the slums of Kinshasa.